Today, I will talk about the top website data hosting companies which provide free domain names with web hosting purchase. Not only will you get the reliability and security with these services, after the buy hosting, they provide you free domains will be able to save $10 to 15 on a domain name. And this is true that there are various affordable local hosting services that can get your website blog up and running well. These host companies are good affordable. So, let’s go to see which hosting companies made the list of hosting company with free domain name. This is the first company that they offer free domain name that you can get at the time of purchasing the hosting. Along with free domain name they also offer free AdWords and Facebook credits. Free With domain name and domain is valid only for 12, 24 and 36 month with hosting plan. Siteground not only offering the free domain name with a hosting account, but you are also get the free domains for life time. The price of Siteground plans is reasonable and the terms of hosting they are so good offering. You only need to pick a domain name at the time of signing up for the hosting. Dream Host are hosting company with the minimum price, I have dream host are offering the best deal for you. On every hosting renewal, they will add registration credit. You can use it to renew your existing domain or buy a new domain any time you want. 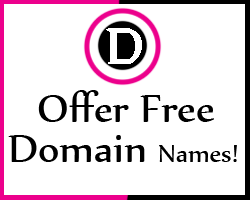 Many hosting companies let you avail the free domain offer at the time of sign-up. So make sure you check all company terms and conduction, because many company are change our TOS any time. And I suggest and recommend you only selected Top level domains (.com, .net, .org, .info, etc...). DreamHost is definitely one of the best website hosting company for any hosting plans you need.